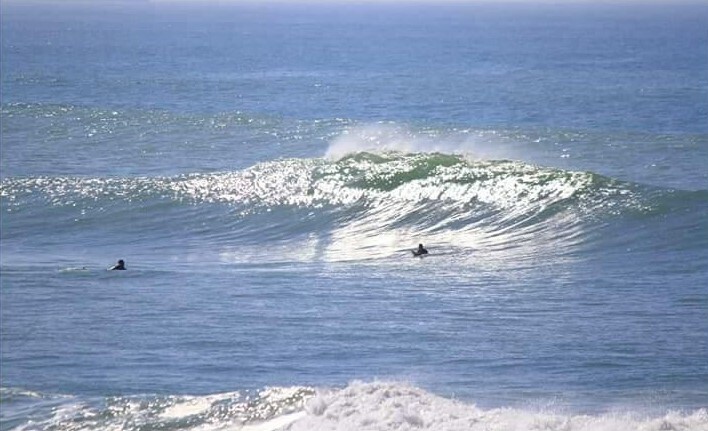 Surf in Morocco Your ideal surfholiday! 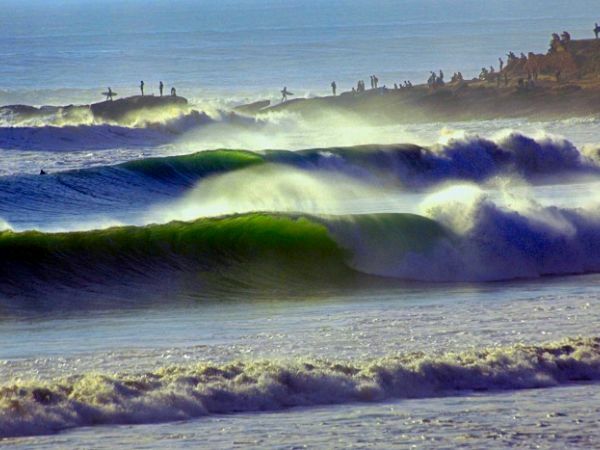 Your home country is not blessed with an endless swell and perfect waves? Need some vitamine SEA? Then Morocco is waiting for you! Surf in Morocco is a dream for all surfers out there. Endless waves are rolling in, ready to be surfed! 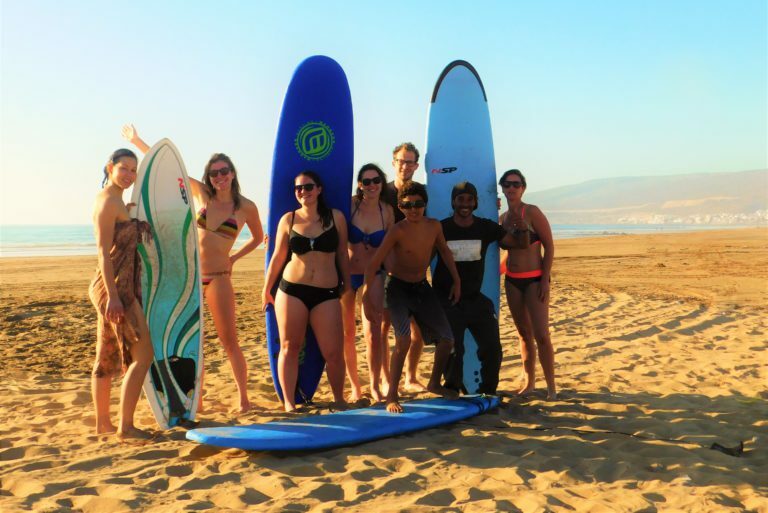 The surfschool of Surf Paradise Morocco is offering you both one week opportunities as multiple week surf trainings weeks, for beginner, intermediate and advanced surfers! All year round fantastic swell! Everything is about surfing here, from all over the world surfers come together in this small surferstown! How is the surf in Morocco? The history of Surf in Morocco is going back to the 60′. The waves in the area of Taghazout and Morocco were rocking, and hippies that visited this area, found the waves. Since then the surfcommunity is growing and growing. Nowdays Taghazout and Tamraght are worldwide well known surfvillages. Especially wintertime is famous for the big swells that are rolling in. The countless of different surfspots are perfect. You can always find a spot for your level, without being in a overcrowed line-up. Our surfschool is located in Tamraght. In front of our surfschool you find surfspots: bananapoint and devils rock. This beaches are on walking distance. Regularly surfcompetitions are organised on this spots because of the constant swell. There are endless possibilities for you during wintertime! Left or right reefbreaks and sometimes swell of more tan 4 meters! You probably have heard about the famous surfspots: Anchor point! Morocco is blessed with so many beautiful beaches and endless surfspots. You can surf in Morocco on every kind of wave possible! Our surfschool is really taking time to choose the surfspot for the day. Depending on your surf abilities, the swell and the tides we choose our destination for the day. This because we want to have the perfect conditions to create an absolute briljant surfing climate for your surfing progress. So the days with Surf Paradise Morocco are always different! Sometimes we drive for 1hour to find fantastic waves, and sometimes we surf right in front of our surfschool. At Surf Paradise Morocco you can both rent surfboards and wetsuits. we always use the highest quality surf equipment to ensure your safety. You can choose between a soft top (suitable for novice surfers) or a hardboard. We have many different sizes and volumes. We take the time to choose a suitable board for you. This depends on your surf level, your size, and the waves that you will surf. You wear a wetsuit while surfing. This is because you will be in the water for several hours. The wetsuit keeps you warm. Moreover, the wetsuit will also (partly) protect you against bumping your surfboard. The wetsuits that you can rent at Surf Paradise Morocco are of new quality. After every surflesson everybody is cleaning their wetsuits. Do you bring your own wetsuit? No problem! A 3: 2 wetsuit is ideal for the Moroccan ocean temprature. The surf in Morocco is perfect for beginners! Most common surflessons are starting with all detailed information and a lot of different techniques. It seems to be really difficult to surf. Study shows that when you get to much information your brains will not progress everything, and your body will block when you try to surf. But learning how to surf can be possible for everyone! During our surflessons we use a 3 step methode. We focus on 3 simple things. This makes learning how to surf much fast and easy! 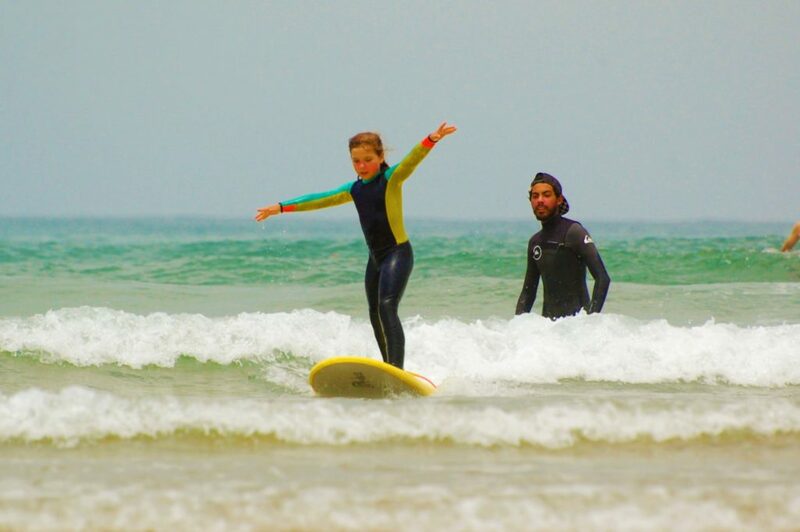 Looking for a surfschool that can bring your surf really to the next level? Looking for great waves and empty line-ups? 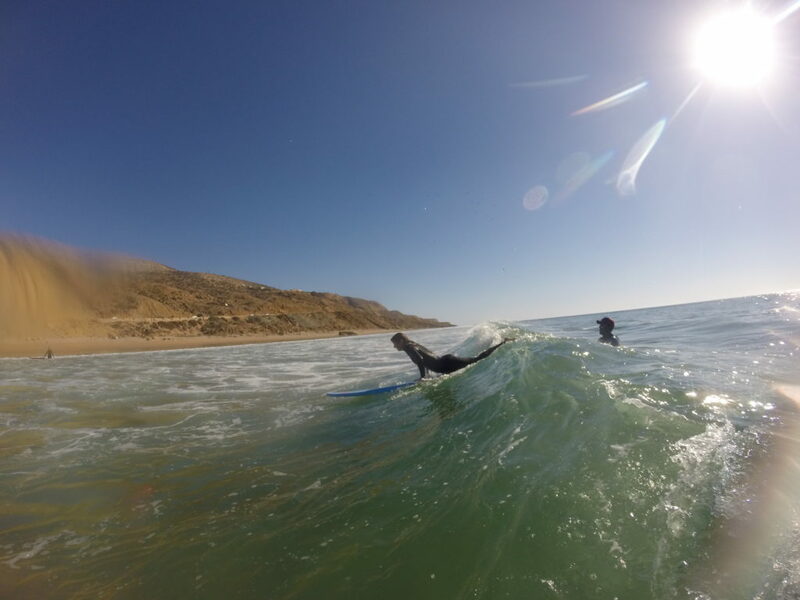 Surf Paradise Morocco offers great surfcoaching from a pro-surfer. We will bring you to the waves and surf in Morocco that are fantastic to improve your surfstyle! Nothing is more annoying then surfing below your level in beginner surflessons. Thats why we offer surfcoaching for intermediate surfers. We go with you in the water to work one on one to improve your surfing skills. Are you an advanced and experienced surfer? This is the perfect way to explore to moroccan coastline and surf in Morocco as much as possible! Whether you want to surf around Rabat or Taghazout, we have the experience and knowledge of all Moroccan coast to show you the best and secret surfspots of the area! You don’t have to waste any time by searching good surfspots or surf bad waves. Our experienced local surfguide brings you excactly to the place where the surf is pumping at that time. We will help you to surf as much as possible and search the best waves for your abilities. 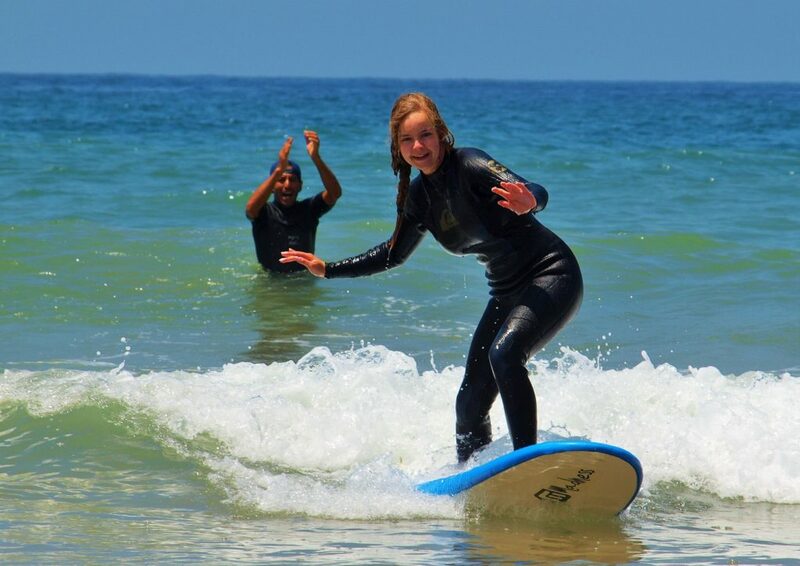 In one week of surf in Morocco with Surf Paradise Morocco I learned the basics of surfing during the surflessons. The surfinstructors were really professional and I felt comfortable and save with them in the water. Because they just use 3steps to learn how to surf it was possible to learn it in 1week. They were all really kind and we had a lot of fun after the surflessons. Always a smile! As advanced surfer it is always a struggle to find a good surfcamp that also offers posibilities for advanced surfers. Zouhir is a great professional guide, with a lot of experience. He showed me the great surfspots around and he did bring me on the good times to the surfspots so it was still uncrowded. What I liked the most was that you can feel that Zouhir gives his surfguidings with all his passion for surf. We had long surfsessions in small groups, and everything was perfectly organised. I rented a surfboard and they have good quality shortboards. All with al I really recommend this place because of it's professionality and passion!